Five years ago, Larry Schultz’s bobcats started killing their kittens. Schultz is one of just two large-scale bobcat farmers in North America. For 32 years, he and his wife, Carol, have raised the animals for fur in Arengard, North Dakota — population 115 — a dot on the state’s western border, just south of Williston. Schultz is an erstwhile trapper who hated to see skinned beavers go to waste and figured he could raise cats on the recycled meat. 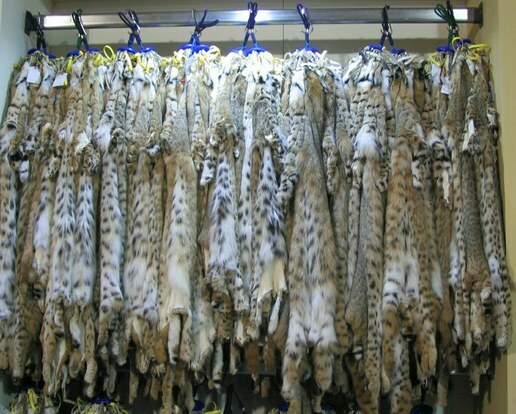 He sells his skins to Canadian auction houses, which ship the furs to Russia, China, Japan and Italy. A good fur, speckled with constellations of black spots against a snow-white belly, fetches him up to $1,100. A high-quality bobcat fur can fetch upwards of $1,000. Photo courtesy of Wikimedia Commons. The last thing Schultz ever expected was international infamy. Yet infamy is what’s been thrust upon him, brought on by the confluence of an oil boom, an environmental review and a coalition of animal rights activists. Arnegard sits at the heart of the Bakken region, the sprawling oil patch now yielding a million barrels of crude per day. When production in the Bakken spiked, so did truck traffic past the Schultz Fur Farm. Soon, as many as 25 semis were roaring by his property every hour, raising a racket and kicking up dust. The stressed-out bobcats responded by killing their offspring. (Although Schultz started his farm with wild-caught stock, today all his cats are born in captivity.) Forty percent of his kittens were slain by their mothers. Schultz decided it was time to flee the Bakken and move to central Montana’s Fergus County, far from the tumult of the oil patch. On June 18 of this year, Montana Fish, Wildlife & Parks (MFWP) completed a pro forma environmental assessment and recommended that Schultz receive a license to operate his relocated farm. The state then opened the assessment to a public comment period — and the fur hit the fan. Schultz hasn’t yet experienced that kind of harassment, but his attempts to depart the Bakken have brought his once-anonymous business an unwelcome notoriety. (When I asked him if he would speak with me, his first question was, “Well, that depends — do you eat a hamburger once in a while?”) Attacking bobcat farms, however, isn’t likely to put a dent in international demand for furs. As long as there’s a market, fur farming — and trapping, currently experiencing a boom of its own — will persist.